George Martin, Beatles producer and “Fifth Beatle,” is dead at 90. 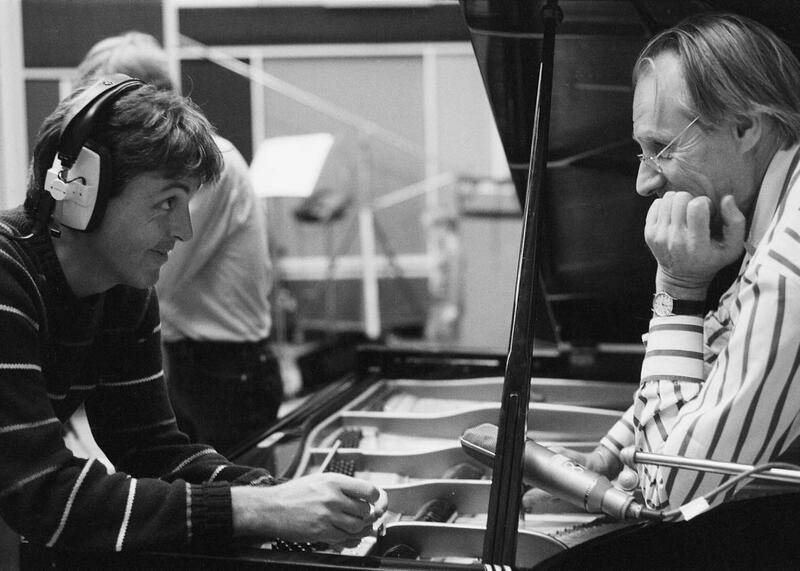 Paul McCartney and George Martin. That man was George Martin, the meticulous, classically trained, but still frequently open-minded producer of nearly all the Beatles’ recordings. Martin died on Tuesday at age 90, but because he and the Beatles did find each other, he leaves as part of his legacy the greatest discography in pop. When the Beatles and Martin first recorded together, they were at odds, across classes and generations, the middle-aged Londoner sounding rather posh and uptight to the raucous Liverpudlians. “Their songwriting was crap,” he later said. “The first record we issued was ‘Love Me Do’ and ‘P.S. I Love You’—which are not exactly Cole Porter, are they?” The Beatles were nervous, and Martin launched into a merciless critique of their mistakes, before asking them if there was something they didn’t like about the session. “Well, for a start,” George Harrison said, “I don’t like your tie.” The Beatles’ well-honed comic repartee disarmed him, and soon they had the studio in tears. The rest is pop music history, and Martin can be heard all over the Beatles’ recordings—sometimes in subtler ways, but sometimes because, well, he himself often played on them. Take that impossible-sounding solo on “In My Life.” Martin played it himself, recording it at half-speed, and then speeding it up, giving it the jaunty-yet-virtuosic sound that makes it bar-for-bar one of the most unforgettable piano solos in pop. Martin often played keys like this with the Beatles—on “Being for the Benefit of Mr. Kite” alone he is credited for contributing piano, harmonium, Lowrey organ, glockenspiel, tape loops, and Hammond organ. Martin also wrote most of the Beatles’ orchestral arrangements, making him (along with McCartney and the Beach Boys’ Brian Wilson) one of the men most responsible for the Beatles—and pop music’s—late-’60s move towards baroque pop. For “Eleanor Rigby,” he wrote the Bernard Herrmann-inspired score for the string octet. For “Penny Lane,” he annotated the piccolo trumpet solo that McCartney hummed for him, before passing the score to classically trained trumpeter David Mason. But McCartney is right to, in his own remembrance today, point to one Martin contribution in particular: His arrangement for “Yesterday,” one of the most covered and most acclaimed pop songs of all time.